What is Careprost (Bimatoprost) used for? 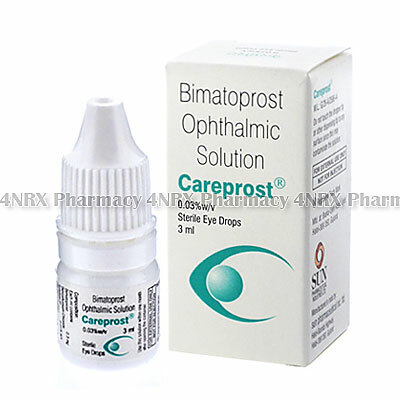 Careprost (Bimatoprost) is an ophthalmic solution prescribed to treat patients who are suffering from open angle glaucoma. The medication increases the drainage of fluid from within the eye to reduce pressure and the occurrence of symptoms such as pain and reduced vision. It may also be applied to the eyelashes to increase their thickness and length. Your physician may also prescribe it for the treatment of other unlisted conditions. How should I use Careprost (Bimatoprost)? Always follow the instructions of your physician and those included with the packaging while using Careprost (Bimatoprost) to get the safest and most effective results from treatment. Most patients are prescribed one daily administration to the affected eye every evening. Your individual instructions will depend on your current health condition, age, and the severity of your symptoms. To administer the drops remove your contact lenses if you wear them, tilt your head back slightly, gently pull down the lower lid of the eye being treated, and dispense one drop into the pouch that is formed. Slowly close the eyelid to spread the medication over the eye and keep it closed for twenty to thirty seconds to allow it to be absorbed. Do not allow the tip of the bottle to touch any foreign surfaces, including the eye, as this may cause contamination. If you are applying the solution to the eyelashes, it is recommended to use an applicator to apply the solution. Only one applicator should be used on each lash and the medication should only be applied to the upper eyelash. Observe the medication prior to each use to make sure it is not cloudy or discolored as this may indicate contamination. Ask your physician any questions you have about using the medication to ensure the correct administration. What are the side effects of Careprost (Bimatoprost)? Serious side effects that may require immediate medical attention are severe eye pain, swelling around the eye, crusting or discharge from the eye, reduced vision, or sensitivity to light. Inform your physician as soon as possible if you experience any worrying symptoms to make sure the necessary changes are made to your dosage to stop further complications from occurring. Careprost (Bimatoprost) should not be used by patients who are pregnant, breastfeeding, or children under the age of eighteen. Also inform your physician if you have closed angle glaucoma, asthma, hypotension, slowed heart rate, dry eyes, no lens in the eye, an artificial lens in the eye, conjunctivitis, discomfort of the cornea, inflammation of the eye, severely reduced liver function, or reduced kidney function. These conditions may cause unexpected health problems requiring special alterations to your regimen. Strictly follow all instructions provided to you by your physician or pharmacist while using Careprost (Bimatoprost). Optimum and safe dosage can differ based on the patient and the condition being treated.